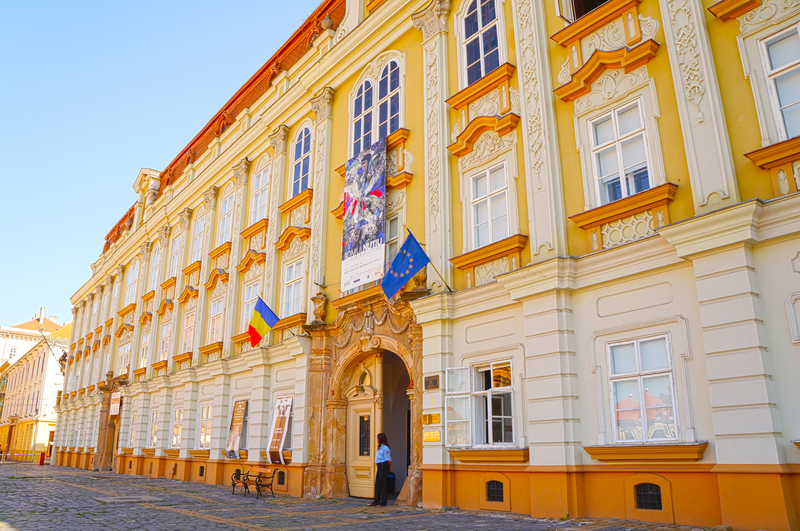 Muzeul de Arta is located in Timisoara’s Unirii Square. The outside of the building matches the general atmosphere of the square with its beautiful, older-styled architecture. After passing through a relatively simple entryway, and not paying for a ticket because we’re students, we come into the main foyer. Large and open, with two sets of spiral staircases opposite eachother on the left and right sides of the room leading up to the gallery itself. The first thing I noticed besides the Victorian vibe of the interior, was how quiet it was inside. Very peaceful, and just the right thing to get one in a mood to appreciate some artwork. The majority of the works were paintings of various styles, as well as a bunch of old china. While exploring the museum, I stumbled upon an exhibition made up exclusively of small statues of swimmers and divers, wearing a mask with a sort of avian style to it. Some of them also had wings. With Adonis-like bodies, the very graceful and strong positions they’ve been molded into, I get the impression that they are gods or otherwordly in some way. All things considered, the ambience and atmosphere of the museum alone make it worthy of a trip. I give this place a 3.5/5 stars. For more information you can visit their website at http://www.macluj.ro/ or call (004) 0264 596 952.